As evidenced by the recent influx of archival discoveries, not-quite revelations, Broadway revivals, and disappointing, why-even-bother merchandise, Back To The Future continues to loom large in the mind of a certain generation that refuses to stop asking itself why George and Lorraine didn't realize that their teenaged son looked exactly like the guy who brought them together and have a subsequent mental breakdown, and other things they should just forget about. 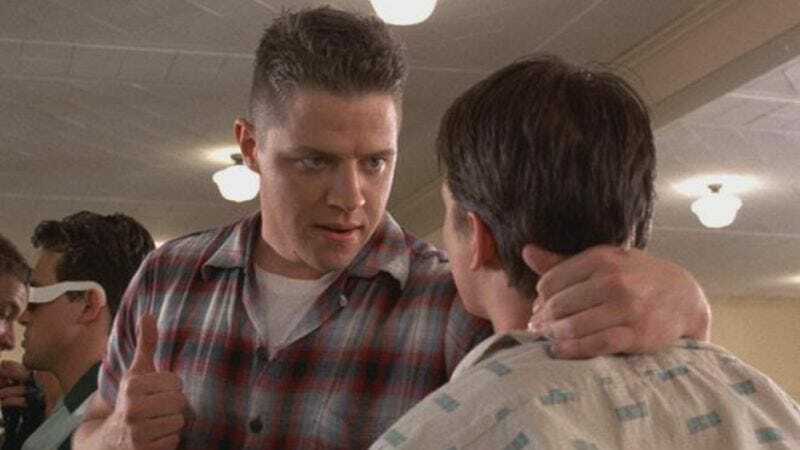 And no one, apparently, knows this better than Tom Wilson, who has compiled the below postcard that he hands out to fans to answer the most common questions he's been asked over the years about playing Biff Tannen, the manure scene, the Delorean, and the relative niceness of Michael J. Fox, Christopher Lloyd, et al. (Pretty nice, as it turns out.) Of course, Wilson has yet to put one together for all your Freaks And Geeks questions, so you can continue to pester him about that at his various stand-up comedy gigs.